If you have not already done so, Install Nessus on MacOSX. Since the Nessus service is running as root, it needs to be unloaded. 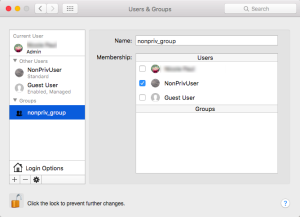 On the Mac, in System Preferences > Users & Groups, create a new Group. 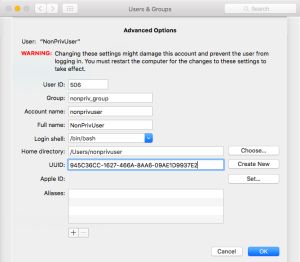 Next, in System Preferences > Users & Groups, create the new Standard User. This user will be configured to run as the Nessus non-privileged account. Add the new user to the group you created in Step 1. Change ownership of /Library/Nessus/run directory to the non-root (Standard) user you created in Step 2. Give that user read/write permissions to the /dev/bpf* devices. A simple way to do this is to install Wireshark, which creates a group called access_bpf, as well as a corresponding launch daemon to set appropriate permissions on /dev/bpf* at startup. 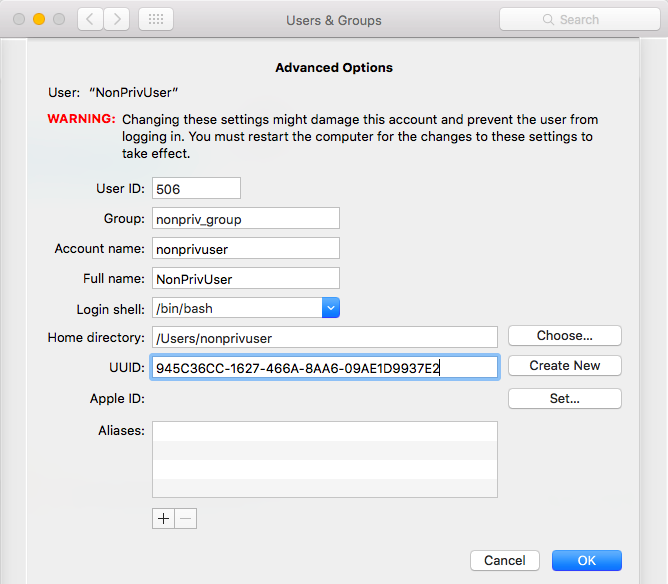 In this case, you can simply assign the nonpriv user to be in the access_bpf group. 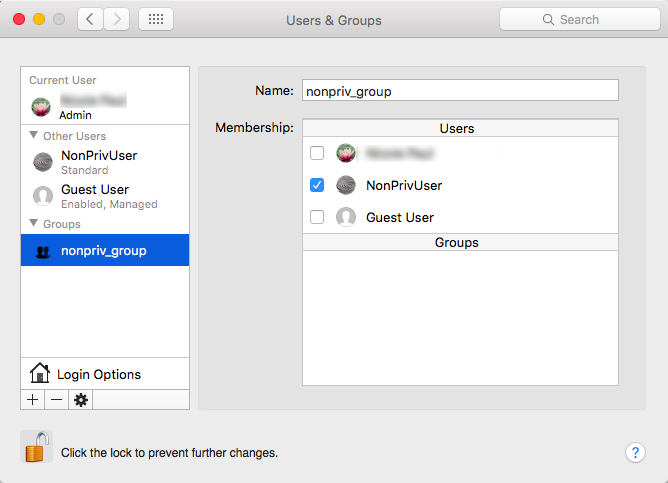 Otherwise, you will need to create a launch daemon giving the "nonpriv" user, or a group that it is a part of, read/write permissions to all /dev/bpf*. For Step 8. changes to take effect, reboot your system. Using a text editor, modify the Nessus /Library/LaunchDaemons/com.tenablesecurity.nessusd.plist file and add the following lines. Do not modify any of the existing lines. If any of the values in Step 9. do not meet the minimum requirements, take the following steps to modify values. Create a file called /etc/sysctl.conf. Using the a text editor, edit the systctl.conf file with the correct values found in Step 9. Next, using the launchctl limit command, verify your OS default values. Example: MacOSX 10.10 and 10.11 values. If any of the values in Step 11. are not set to the default OSX values above, take the following steps to modify values. Using the a text editor, edit the launchd.conf file with the correct, default values as shown in Step 11. Note: Some older versions of OSX have smaller limits for maxproc. If your version of OSX supports increasing the limits through /etc/launchctl.conf, increase the value. For all changes to take effect either reboot your system or reload the launch daemon.